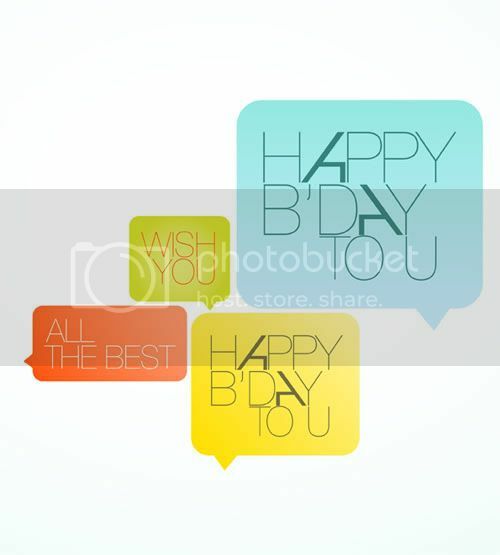 This design is dedicated to all my friends who having a birth day ceremony a few days ago. It's a simple design, only with a few ornaments. This ornament actually inspired from twitter's layout design. It has simple shape but very nice to be used. I used the Helvetica LT ultra thin 25 with some modification. I also used the Avant Garde ALT for the "A" letter. I choose an easy looking font on this design. Yeah because this design concept emphasis on its simple. So Any one can use this Design:? Those portfolio designs are so crazy, that's perfect for my girlfriend because she's a crazy woman, besides she likes finding out different things in order don't get bored. ucapan ulang tahun yang kreatif, jadi ga membosankan. kalau tulisan di dalam kotak masih bisa dirubah dan diganti wana gag boss??? Those design are simple yet good! Nice designing you have shared it's beneficial for me. Hay i like this article...because its my one of the favorite subject during my graduation.. Fantastic blog! I dont think Ive seen all the angles of this subject the way pointed them out.there are so much to say and know so much about the subject . This is a great article tackling some of the most difficult issues we have to face in the work place. I can’t wait to read more from you. Valuable information and excellent design you got here! I would like to thank you for sharing your thoughts and time into the stuff posted!! Thanks for giving a creative tool.One can effectively present feelings. Thank you for helping to talk over this opinion, I feel strongly about idea and like to learn quantities of things on this item. If possible, as you get knowledge, would you care renewing your site with a little more info? It’s very great for me. Thank you for the good share. The ideas were so brilliant. Never thought I would find some good ideas from here. This is my first time I visit here. I found so many interesting stuff in your blog!! especially its discussion Laughing From the tons of comments on your articles Smile I guess I am not the only one having all the enjoyment here Smile Keep up the excellent work!! In every country, there are really places which are yet to be discovered. If you are an Internet savvy person, you certainly will be able to research on these places online through blogs posted by people who have already found out about the places. I tell you, I usually get irked when folks discuss issues that they plainly do not know about. You managed to hit the nail right on the head and explained out everything without complication. i read this blog occasionally and i own a similar one and i was just wondering if you get a lot of spam comments? If so how do you prevent it, any plugin or anything you can advise? I get so much lately it's driving me mad so any assistance is very much appreciated. I have to say that your analysis in this article is greatly remarkable. I very much enjoy your article. This blog is really excellent and I truly appreciate it. Good job! Interesting post and I really like your take on the issue. I now have a clear idea on what this matter is all about. Some time before, I did need to buy a car for my business but I didn't have enough money and could not order anything. "Fantastic website! I thoroughly enjoyed your content …very effectively written.Thanks for this service that you have provided for us to have the ability to fresh our minds. Loads of excellent writing here. Please keep up the good work"
"Hello I just wanted to leave a comment to say that I enjoy your blog. Looking at the number of comments, I see others feel the same way!CQM"
I found this site very informative because very qualitative stuff is available over here.Thanks. I like concept of your post. Very creative post. Best of luck and waiting for some new ideas. I am looking for such useful information and I found here a lot of it. Useful information shared.Iam very happy to read this article. Thanks for giving us nice info. This is an interesting approach. A perception of how one is viewed certainly does influence what we say and don't say. It is a great post for the people to get the proper information. This is one of the awesome posts. I like your blog details. This is a very informative topic and it was a good read.Thank for posting. These things are the fresh and having good information are posted here, and also am seeking for this kind of information thanks for updated. You know exactly what youre talking about, exactly where other people are coming from on this issue. Im glad that I had the fortune to stumble across your blog. It is good of you to share this useful information with us. It's actually a pleasant and helpful piece of information. It is a effectively written blog. Good post, looking more like it, hope you can still see good work. I always dreamt to achieve global fame by success in my business. To buy facebook fans from fanbullet.com was the step towards this dream and after a while I also made the move to buy facebook likes gradually, since then I felt it coming true, and now I see my dream as a reality. Well crafted information, and i currently learned that some groups are more likely than others (since all of us are unique) would share the same idea. I hope you bare this blog operating well. Amazing those birthdays card design. great design i like it! Your birthday card design is so beautiful and attractive. good design i like it.